ysabetwordsmith | Poem: "Under Her Coat"
This poem came out of the July 2016 Creative Jam. It was inspired by a prompt from mdlbear. It also fills the "begging" square in my 7-16-16 card for the hc_bingo fest. This poem has been sponsored by Anthony & Shirley Barrette. It belongs to the Officer Pink thread of the Polychrome Heroics series. a week or two and then moving on. check the balance on the card. might not come back from. furtive as any street person. it was difficult to fake. lined with some brindled fur. gloves or good winter hats. no one had managed to pick. sweet with honey and apples. Turq found kindness a beauty all its own. a packet of drugs or a quick screw. off of the walls and the pillars. the banks of gravel and clay. unwanted, and actually safe to touch. today they found a local girl camped out. then gotten stranded here as a result. and when that was done, she sat back down. and she thanked him with a fleeting smile. Turq knew that she rarely spoke. the far side of the bridge there. the crude scribbles off of the concrete. Some say, under her coat she has wings. Even without a name, Turq knew who it must be. and chanced to look down. spread over the dry brown dust. an owl took off after catching a mouse. walked back toward the group. Hallah (Haley Kramer) -- She has tinted skin, brown eyes, and long brown hair. She also has wings, barred in brown on cream like an owl. Her parents kicked her out of home for being a freak. She survived on the street, but encountered the usual problems of sexual assault and drug abuse. Eventually Hallah began finding jobs as a scout or courier because of her wings, which paid much better. She managed to get off the street, but she still feels sensitive about it and spends a lot of her resources taking care of the homeless. She often travels around for her work, and uses that to reach people all around Missouri. Origin: Her wings emerged with puberty, and she learned to fly about a year later. Uniform: Hallah hides her wings under loose, shapeless clothing when she is not flying. She usually wears a long coat of heavy green canvas with a fur-lined hood. Motivation: To take care of the poor and downtrodden. "One of my friends told me about some graffiti he saw on a bridge: "Some say, under her coat she has wings." Whoever that unknown graffiti artist was, inspired this song. Thank you." 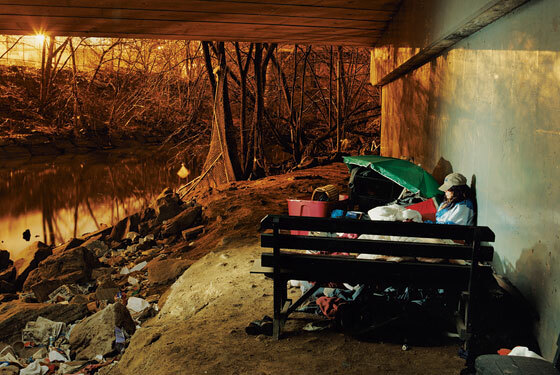 Homelessness is a widespread problem spanning various subgroups. There are national and community measures to end homelessness. You can see that Terramagne-America is a step ahead by including current or former homeless people in their efforts, which avoids a lot of mistakes that inexperienced residents would otherwise make. Here are some ways that individuals can help too. Respect is vital for homeless people, but often more privileged people violate their rights. So there's a movement toward a Homeless Bill of Rights. These may protect such rights as freedom of movement and privacy, or include a necessity clause to prevent charging people for crimes when they had no alternative. Know how to respect poor and homeless people. Homeless people have a culture of their own, which includes fanciful or inspiring stories about spirits, fairies, angels, the afterlife, and other ideas. Challah is a sweet, rich bread which may be enhanced by adding such things as honey and apples. It is commonly braided. See the Bluehill bridges with graffiti and a bench. 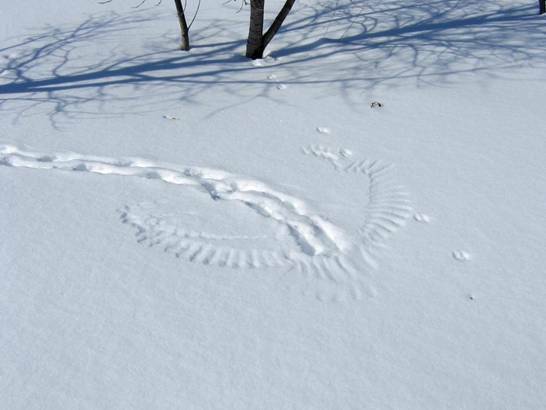 Birds can leave impressions in dust, mud, snow, or other soft materials when landing or taking off. Here are unlabeled and labeled impressions of a hawk catching a vole, and a snowy owl catching a rabbit. That citrus cleaner is good stuff. So too is Simple Green, a cleaner based on, of all things, chlorophyll... it's murder on mildew without being murder on your lungs. I like this Hallah lady. Courier work pays well, does it? :D Yep. And that song is a personal favorite, too. I've seen challah in many shapes, and with all kinds of added tidbits. The fancy ones are easier to find around the holidays, but some bakers offer them at other times too. The links I included do mention the holidays. Since it's late autumn/early winter in this poem, I figured that people would start putting out the festive goodies. :D I based it on some we have for removing goo. Oh, I'll have to remember that. We were looking for mold/mildew killer a while back that wasn't bleach. Typically so. T-America has a lot more technology and superpowers that sometimes make privacy more challenging to protect. But the same things also give them more options for couriers, who may have wings like this or may ride a zipcycle, etc. There are oddjobbers, messengers, and errand runners on the casual end of the scale. Bonded couriers are the top of the line -- highly paid, highly trusted, highly respected. They carry things where security, privacy, and/or speed are paramount. Favorite of mine, too, obviously. Up there with Ship of Stone, Ripple, The Mary Ellen Carter, When I Go, Kitchen Heroes, and maybe a few others. The ones that are so good I can't tell which I like more. I'm really glad this one got sponsored. I currently use Seventh Generation cleaner, which uses thymol (thyme extract) as its primary cleaner. It apparently does pretty well on mildew, too, and cleans up soap scum (though that might be the surfactants combined with the thymol). I clean my sink and shower basin with it now and then. Yeah, nowt better on soap scum than a good detergent. Thymol, eh? Have to try that sometime. Ours had iron, back when it was still drinkable. I suspect agricultural contamination. It stank. Sometimes it turned black. Sometimes it foamed when I'd fill a water garden. I wanted to catch a different perspective of Turq, show him interacting with more people and starting to take part in community activities. Plus it's a chance to show more of Bluehill's civic pride and sanity. Not everything is officially organized into cohesive programs, but they have a lot of smaller initiatives that actually coordinate pretty well. I'm glad you've shown us this view. How does Turq know if it's safe, etc.? * He knows what drug paraphernalia, weapons, and a wide variety of other dangerous things look/smell like. * He would sense if there were wild animals nesting in a pile of stuff, that might bite people if disturbed. * He can usually tell the difference between things that have been thrown away and those which have been set aside for later use, based on how carefully they are arranged (or not). * Occasionally people boobytrap stuff so it won't be disturbed. He knows what a lot of that looks like, too. Now compare Turq's level of knowledge with that of average working-to-middle-class teenagers or college students. His life experiences have equipped him to spot a lot of hazards they wouldn't even know to look for. :D The longer he stays free, and spends time with healthy people, the more his innate personality reasserts itself over the survival mode. It's a slow process and a bumpy ride, but he's making a lot of progress. Yay! I'm glad you liked that. It's another little glimpse of how positive T-America is, that even marginalized people tend to pitch in and others respond favorably to that. Reading the lyrics of the song, I found myself thinking that it would fit well into the Fledgling Grace universe. It's nice to see Turq slowly easing his way into the fringes of an actual community. This is a big step forward for him, that he's willing to work with a group of people instead of reflexively hiding. :D Now that you mention it, yes. That's a perfect match. It really is. After Ansel made contact, Turq gradually started connecting with a few other people. Now he is ready to interact more. What makes it work in this case is that they're outdoors, so he can bolt if he needs to, and they're doing something which is useful but not crucial, so if he has to leave then it's not a disaster. Right now Turq needs low-stress, low-obligation contacts. Then he can build on those to do more later. Valkyjr have wings from birth... but when they interbreed with 'ordinary' humans, sometimes the latent genes mean the child will produce wings at puberty, occasionally, like a super-power. These genes can also skip a generation or two, remaining silent, until some chance combination of genetics and environment triggers development. That's fascinating. Thanks for sharing. It's funny actually, that's one of those little snippets of back-story I've had sitting on my hard-drive since I started writing about Theodora. Just never had any reason to include it anywhere. Oh ho! Thank you; this adds some further dimension to Theodora. Of course, not all of them have Theodora's aura... and saying more about that would be spoilers.